Kingston 16GB SDHC Video Memory Cards were designed for today's latest camcorders and digital cameras. A fast, Class 4 rating ensures a minimum sustained write speed of 4MB/second. This guarantees consistent standard definition and HD video capture. 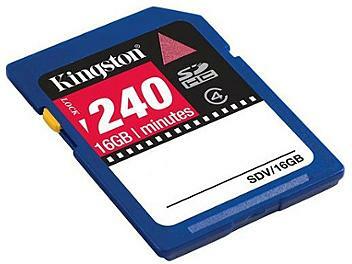 Fast and reliable, Kingston memory cards are an excellent value for all of your video needs. Compatible with all SDHC compliant camcorders and digital cameras, this high capacity memory card can hold up to 240 minutes of video footage.